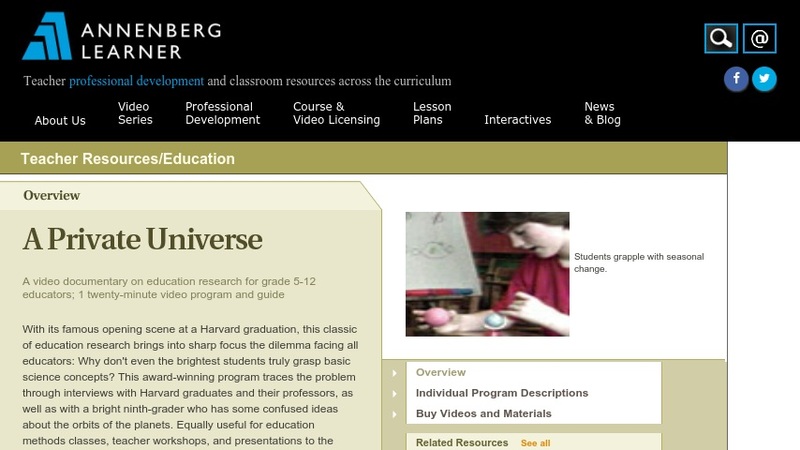 This site describes and provides access to a twenty-minute video documentary on education research for grade 5-12 educators. With its opening scene at a Harvard graduation, this video program explores why so few students truly grasp basic science concepts. The program traces the problem through interviews with Harvard graduates and their professors, as well as with a bright ninth-grader who has some confused ideas about the orbits of the planets. This site also provides individual program descriptions as a printable page and information about how to buy videos and materials. The video is also available as streaming video if the teacher or instructor signs in.